Fiskars Axes – More Power. Less Effort. Fiskars have continued to impress us with their high quality and comfortable tools, and this 4th generation of Fiskars Axes has particularly grabbed our attention. Already efficient with their lightweight and balanced design, Fiskars have increased their range, improved their packaging and devised a guide so that you can choose the right axe for the job. Thanks to their newest model, the X21, you now have a bigger range of axes to choose from than ever before. 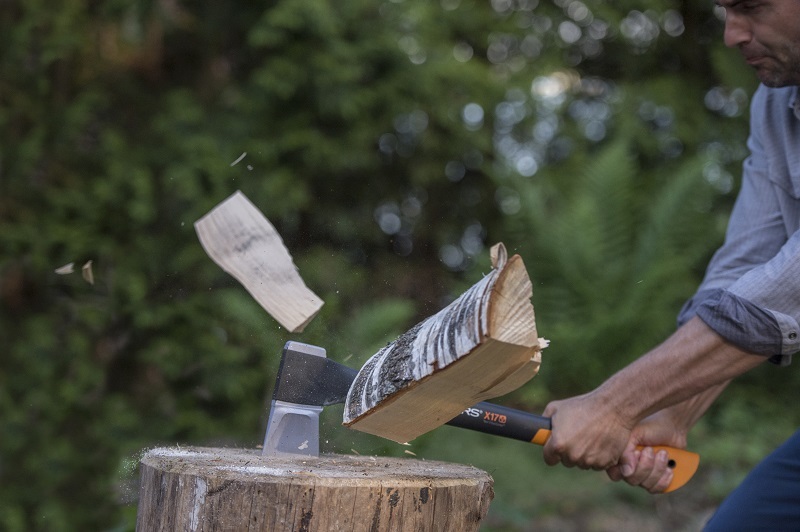 This means no matter your size, or your level of expertise, or the diameter of logs you’re splitting, Fiskars have the perfect axe for you. Like many keen gardeners, if you frequently do axe work and need a lightweight axe to split logs super fast and super efficiently, you’ll love the X21. Take a quick online test to find your best suited axes, then print out your recommendations. This test is incredibly smart! It takes in to consideration your height, wood size and type, frequency of use, and other details to accurately determine the best axes for you! Watch a video and choose the perfect axe for your needs. Once you’ve got your list of options, you need to check which axe is best for you in reality. With too heavy axe you can’t deliver powerful strikes repeatedly. You lose accuracy and get exhausted quickly, risking your own safety. That’s why it is important to test that the axe is ideal in weight and length for you. Type in your postcode to find your nearest retail outlet stocking Fiskars, and bring your printout. So simple to navigate and easy use. You’re assured the correct axe for the job, with the most comfort. Now that’s more power for less effort!